The origin of the name Scudder is unknown. But Scudders like to believe that their name comes from the nautical term “Scud” – to sail full speed before the wind”. Therefore one who scuds is a Scudder. Scudder being a derivation from the Dutch, “Schutter”, shooter or marksman. Which may explain the 3 cannon balls on the crest. Old English “Scutt”, which was an occupational name for a scout or spy. Also nickname for a swift runner. Another less-likely definition is that the name derives from the Latin Scutari — shield bearer. Gules on Fess or Three Pellets, in Chief as many Cinquefoils Argent. Gules – or red denotes military fortitude and magnanimity. It is also the “Martry’s Color”. Fess – A band, borne in the center of the shield; a military belt or girdle of honor. Pellet – A Black Roundel, representing a cannon ball. Chief – That which occupies the whole of the top and one-third of the total surface of the shield of arms. It, signifies dominion and authority. It has often been awarded for prudence and wisdom,as well as successful command in war. 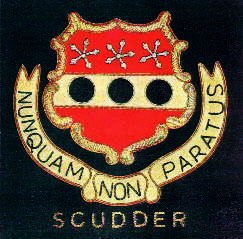 The Scudder motto is “Nunquam Non Paratus” – “Never Unprepared”. All members of the Association are invited to take a look for your relatives and if you don’t see them, contact our Historian to have their information included here. 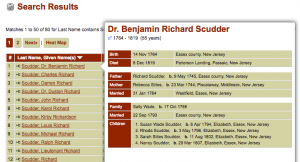 Our Family Historian, Margery Boyden, is a skilled researcher who has extensive experience with the Scudder family genealogy and is in the process of making corrections to earliest generations in our database to reflect the most up to date findings from Scudder Association publications and other scholarly sources. This will build on the fine work of our previous historian Chris Scudder (1945-2018) who compiled much of the information in these pages. 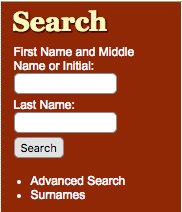 This online family scrapbook is an excellent way to save the information for future generations. This is a wonderful opportunity to discover your Scudder heritage. We hope you find the database useful and look forward to having you join the Association to fully benefit from the wealth of data available.